We warmly welcomed this ethereal dreaminess into our wedding veil collection. 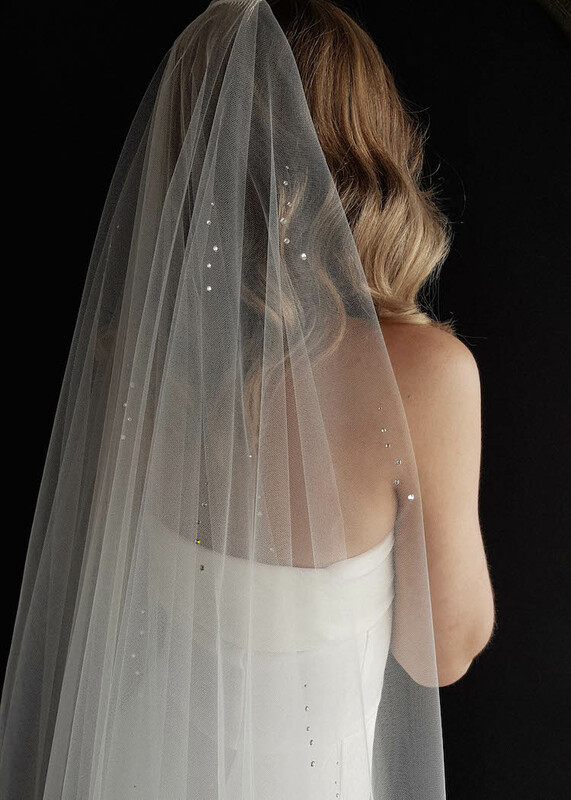 True to its name, the Lucia wedding veil with crystals is graceful and luminous, featuring trickles of Swarovski crystals that perfectly cascade from your head to your toes and beyond. This cathedral wedding veil feels light and modern, allowing your wedding dress to take centre stage. The perfect veil for fashion forward brides that can be worn alone or with headpiece or statement earrings. Long blusher layer to pull over your face. The Lucia wedding veil with Swarovski crystals is made to order. Please allow 8-12 weeks for production plus delivery times. Rush orders available for a fee. We love to style the Lucia crystal wedding veil with wedding dresses that are modern and sleek. The striking silhouette also pairs perfectly with more traditional gowns, statement skirts, flowy ball gowns and lace wedding dresses. The Lucia veil has been cut to a width that suits wider skirts and dresses with trains. Our Lucia veil falls to 300cm from the comb to the end of the train. It can be customised to regal cathedral length at 350cm+ upon request. If you are unsure which length will best suit your wedding dress, please contact us with photos of your wedding dress and height and we can get back to you with a recommendation. 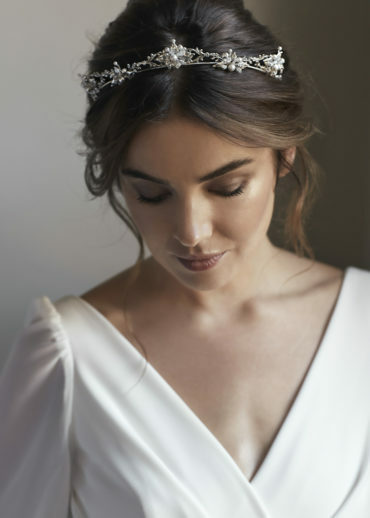 The Lucia veil features a long blusher layer which is designed to be pulled over your face for the ceremony or to capture beautiful photographs throughout the day. The blusher layer can be worn back, if you wish, and creates a beautiful cascade detail at the side. The blusher layer can also be customised to suit your height and hairstyle. The Swarovski crystal embellishments are double sided on the blusher layer to ensure that when the blusher is pulled back, the crystals will sparkle from every angle. The Lucia is handcrafted from a lightweight bridal illusion tulle. It’s available in bridal white or soft ivory tones. We like to aim for a colour match or a shade lighter than your wedding dress.